(Vulpes macrotis mutica) Kit foxes appear to be able to survive without drinking water. This is an adaptation to living in desert conditions where they get almost all of their water from their prey. What does the Kit Fox eat? Kit foxes are the most carnivorous of all the foxes; they eat kangaroo rats, mice cottontails, hares, ground squirrels, birds, insects and reptiles. Kit foxes can live up to 10 years in captivity. How many kit foxes can be born at a time? Between 3-5 kits are born at a time. Kit foxes are found in northern, central and southern California. Kit foxes appear to be able to survive without drinking water. This is an adaptation to living in desert conditions where they get almost all of their water from their prey. The pads of their feet are very hairy; this helps them with traction on sand. The kit fox has very large ears. They use these large ears to help find rodents and insects underground and also to cool themselves off in the desert heat. 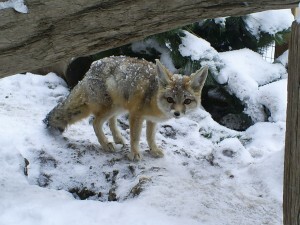 The San Joaquin kit fox is considered to be endangered. The kit fox is also the smallest of all the foxes in North America. Roseanne (but we call her Rosy) – She came from the California Living Museum in 2006 and was about 2 years old at that time. She could not be released back into the wild and they had too many foxes for their exhibit so we said we were happy to give her a home. Kit foxes are very high strung and nervous so you may see her constantly running in her exhibit. She is also very curious, so you will see her peeking at whatever is going on around her cage while she whips by. Even though she is a desert animal, we have seen her happily rolling in snow when she thinks no one is looking. Kit Kat— male; was rescued in 2015 when a wildlife biologist noticed that he had a severe leg injury and had separated himself from his group.